Pollen - in view of its specific chemical composition it boosts the biological balance, invigorates both physical and mental activity, improves the body's resistance capacity, as well as mental stability. 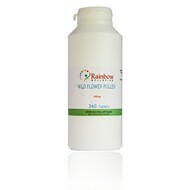 Family pack of 360 tablets x 500mg of wild flower bee pollen. 500mg of wild flower bee pollen.